It even has a "pleasure" key fob. Giggidy. Mercedes-AMG and Cigarette Racing teaming up to make speedboats is nothing new, but this has to be the most extraordinary example of the pair's collaboration yet. Presented at the 2017 Miami International Boat Show, what you’re looking at here is the 50’ Marauder AMG, a 3,100-horsepower speedboat inspired by the range-topping Mercedes-AMG GT R. The beastly boat was built to celebrate the 10th anniversary of the two companies coming together, as well as the 50th anniversary of Mercedes-AMG. 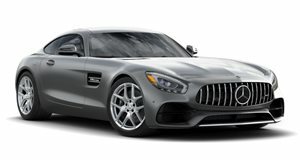 Thanks to extensive use of carbon fiber on the deck, cockpit and consoles, the 50’ Marauder AMG is 1,298 pounds lighter than its predecessor. Even the engine hatch is constructed from carbon fiber, and the electrical system has been tweaked to shed any excess weight. Power is provided by two Mercury Racing quad cam engines with two settings selectable via an electrical key fob. Select the aptly named "pleasure" key fob and each one delivers 1,350 hp with 91 octane fuel. Switch over to the "race" fob and power is increased to 1,550 hp per engine, delivering a total of 3,100 hp. To make the GT R’s influence abundantly clear, Cigarette Racing enlisted Daimler’s chief design officer to design the paint and detailing of the 50’ Marauder AMG. The interior seats were designed by AMG Performance Studio, there’s a special logo commemorating AMG and Cigarette Racing’s 10-year partnership on the bow of the vessel, and the green paint detailing is the same striking shade of "Green Hell Magno" as the GT R to create “an instant connection” with the car. We have to say that of all the boats these two companies have worked on together this one most looks like the car that inspired it. “The 2017 50’ Marauder AMG is a particularly striking result of our continued collaboration with the Cigarette Racing Team, and a fitting tribute to honor 10 years of working together,” said Gorden Wagener, chief design officer for Daimler AG. Performance, perfection and passion are the values that unite Mercedes-AMG and Cigarette Racing. Based on these values, eight sensational special editions have been created during our successful ten years of collaboration, and the 2017 50’ Marauder AMG presented here is a particular highlight among these. One racing icon has inspired another, and we are proud to continue to set the benchmark and seamlessly combine design and performance both on land and on the sea," said Tobias Moers, chairman of the board of management of Mercedes AMG GmbH. If you want one, it's apparently "price-on-request." But let's be honest. If you're someone who can realistically afford something like this no price will really be too high.